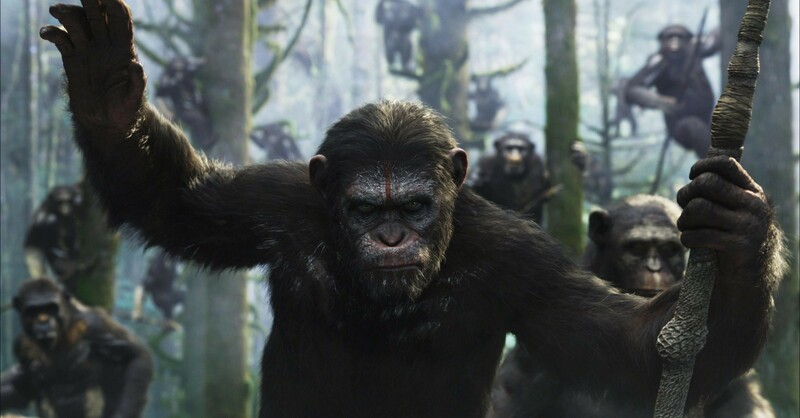 Following up 2011’s Rise of the Planet of the Apes comes Dawn of the Planet of the Apes. Taking place some years after the events of the previous movie, Dawn of the Planet of the Apes sees a Planet Earth in which most of humanity has been wiped out with the outbreak of the same virus that boosted the apes’ intelligence. Apes now dominate the North American landscape, and there is but a fragile peace between the two species. It’s been a while since the last time I’ve seen a movie where the whole time I was thinking, “Those special effects are really nice!” Aside from a few early shots, when the apes were hunting in a rainy forest, which looked a little to obviously computer-generated, I had no trouble believing the apes were real, even when they were interacting with the human characters. Caesar was particularly impressive in how he was modeled on Andy Serkis. I do realize Dawn of the Planet of the Apes is more about apes and how they went on to take over the world from humans, but the human characters felt like they were little more than convenient plot devices. Malcolm (Jason Clarke, who you may recognize from Zero Dark Thirty) tells us his son Alexander (Kodi Smit-McPhee) has seen things no child should ever have to. What were those things he saw? I sure would have liked to know! I learned so little about the human characters that I wasn’t really inspired to care about them as much as I would have liked. Ultimately, where Dawn of the Planet of the Apes stumbled was where many other summer blockbusters do: it put most of everything in a backseat to the special effects, which again were impressive. For that reason, I would even go as far as to say I actually liked Rise of the Planet of the Apes more, and both movies still failed to capture what made the original Planet of the Apes special to begin with. I went into this movie with high hopes, and I have to admit Dawn of the Planet of the Apes fell a little short. On another note, I had a hard time being frightened of apes wielding machine guns. No matter what you do, I think putting a gun in a chimpanzee’s hands is instantly funny. It’s just a simple fact of life. I use this video, incidentally used all those years ago to promote Rise of the Planet of the Apes, to prove my point.